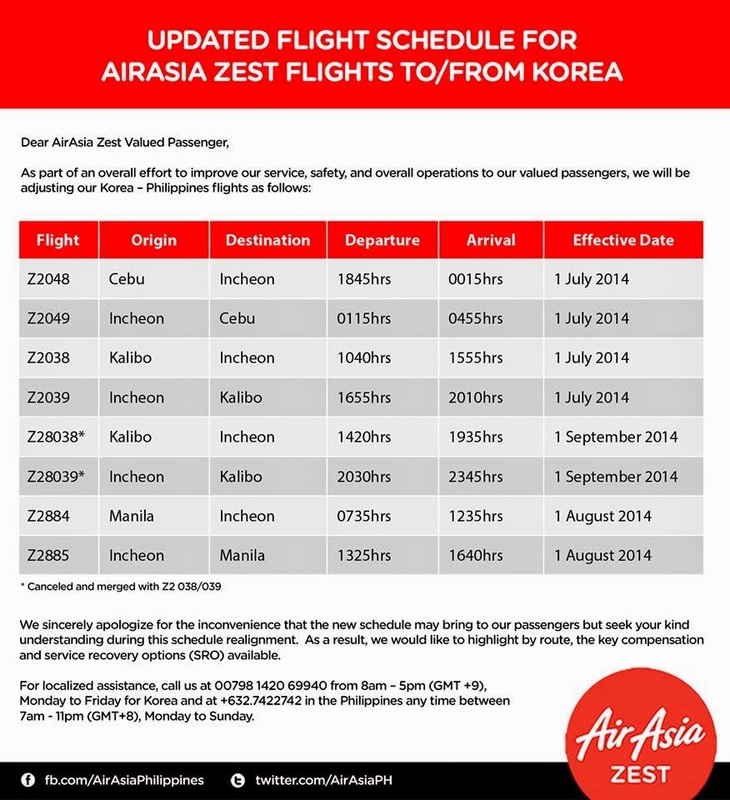 Aviation Updates Philippines - According to a press release published by AirAsia Zest, it will be realigning operations in the Philippines-Korea routes. The airline said that it is part of an overall effort to further improve passenger service and safety. The new cancelation effective date for Z2 8038/Z2 8039 is from September 1st, 2014 and will operate normally until August 31st. As the cancellation has been postponed to September, AirAsia Zest will notify all the passengers who booked Z2 8038 / Z2 8039 in July and August about the reinstatement via e-mail and SMS. If passengers who have already changed to other flight re-routings or requested refunds BUT would like to take our reinstated 8038/8039 flights, we will accommodate them as requested. Those passengers, we will send e-mails and SMS to inform them that their original flights have been reinstated and they have the option to be re-booked. For this, passengers will need to contact our Customer Call Center, Incheon Airport office, send an e-mail to aaz_korea@airasia.com, or utilize Live Chat or submit eForms via the AirAsia website. Z2 038 and Z2 039 flight re-timings will be effective July 1st. Passengers for Z2 8038 / 8039, will be automatically moved to Z2 038 / Z2 039 on the same day of departure, which is ~3.5 hours earlier than their original departure times. This will minimize disruption to passengers’ hotel bookings and their travel times. For each affected passengers, credit shell of $100 USD will be given. The credit shell is valid for one year from issuance as a compensation which can be used to purchase AirAsia, AirAsia Zest and AirAsia X seats to any destinations including online products and services. Passengers may request full refund of the ticket value for the flight. Passengers who requested full refund can receive credit shell amounting 20% of the ticket fare excluding taxes. If passengers are unable to make the earlier timings for Z2 038 / 039, we will provide passengers with the option to change their travel date or travel via Manila (i.e., Incheon – Manila – Kalibo – Manila – Incheon) based on availability. If the Manila connection requires an overnight layover, we will provide complimentary hotel accommodations, transfer between hotel and NAIA airport, and meal vouchers (estimated value worth up to 150 USD). For the Manila connections, complimentary shuttle transfer between Terminal 3 (Incheon to Manila or Manila to Incheon segments) and Terminal 4 (Manila to Kalibo or Kalibo to Manila segments) will be provided to passengers. For affected passengers who wish to change their flights but cannot be accommodated via change in travel date or flight re-routing via Manila due to no seat availability, we will request passengers to purchase economy class tickets on alternate airline(s), such as Cebu Pacific, Philippines Airlines, etc. and will provide reimbursement upon submission of appropriate itinerary and purchase receipt to AirAsia Zest. Passengers who present themselves at the Incheon or Kalibo airports at the original Z2 8038 / 8039 flight times because they claim to not have received prior notification on the new timings, will be accommodated to the next available Z2 038 / 039 flight and will be provided with complimentary airport hotel, hotel transfers, and meal vouchers (estimated value worth up to 150 USD). Z2 048 and Z2 049 flight re-timings will be effective July 1st. Passengers will be automatically moved to the re-timings on the following day (for Z2 049) and same day (for Z2 048). For each affected passengers, credit shell of $120 USD will be given. The credit shell is valid for one year from issuance as a compensation which can be used to purchase AirAsia, AirAsia Zest and AirAsia X seats to any destinations including online products and services. Passengers who requested full refund can receive credit shell amounting 20% of ticket fare excluding taxes. Passengers may elect to change their travel date or travel via Manila (i.e., Incheon – Manila – Cebu – Manila – Incheon) based on availability. For affected passengers on Z2 048, if necessary, we will provide complimentary Cebu airport hotel accommodations, transfers between airport and hotel, and meal vouchers (estimated value worth up to 150 USD) for the next day flight (those passengers on the original flight timings exclude any flight moves). For transportation in Incheon, we will provide reimbursement for taxi services (only those living in the Metro Seoul Area), up to KRW 50,000 – reimbursed upon submission of proper documentation/receipts. For those who wishes to stay overnight, we will provide Incheon airport hotel accommodations, transfers between airport and hotel, and meal vouchers for passengers (estimated value worth up to 150 USD). Passengers are then responsible for their own transportation the follow morning. For affected passengers on Z2 049, passengers who have hotel reservations in Cebu, we will reimburse the cost of one night’s stay – provided passenger provides proper evidence of reservation/payment/hotel rate. For the Manila connections, complimentary shuttle transfer between Terminal 3 (Incheon to Manila or Manila to Incheon segments) and Terminal 4 (Manila to Cebu or Cebu to Manila segments) will be provided to passengers. For affected passengers who wish to change their flights but cannot be accommodated via change in travel date or flight re-routing via Manila due to no seat availability, we will request passengers to purchase economy class tickets on alternate airline(s), such as Cebu Pacific, Philippines Airlines, etc. and will provide cash reimbursement upon submission of appropriate itinerary and purchase receipt to AirAsia Zest. This is only upon confirmation by the AirAsia Zest agent. Passengers who present themselves at the Incheon or Cebu airports at the original Z2 048 / 049 flight times because they claim to not have received prior notification on the new timings, will be accommodated to the next available flight and will be provided with complimentary airport hotel, hotel transfers, and meal vouchers amounting up to USD150. If they choose to return home, instead of staying at the hotel provided, we will provide reimbursement for the airport bus / train transportation up to KRW 50,000 upon request with evidential document as well. For each affected passengers, credit shell of $80 USD will be given. The credit shell is valid for one year from issuance as a compensation which can be used to purchase AirAsia, AirAsia Zest and AirAsia X seats to any destinations including online products and services. Passengers who requested full refund can receive credit shell amounting 20% of flight fare excluding taxes. Passengers who present themselves at the Incheon or Manila airports at the original Z2 884 / 885 flight times because they claim to not have received prior notification on the new timings, will be accommodated to the next available flight and will be provided with complimentary airport hotel, hotel transfers, and meal vouchers (estimated value worth up to 150 USD). Upon request by the affected passengers, AirAsia Zest will provide official document about AirAsia Zest’s new schedule for the passengers to submit it to travel agencies, hotels and insurance company. AirAsia Zest’s Korean call agents at the call center will inform all the affected passengers via SMS, e-mail and call and also the affected passengers can inquire further via live chat or E-form on www.airasia.com, facebook and twitter. Please access the LiveChat function on our AirAsia website for online connectivity to our customer service agents. Due to expected high call volumes, we recommend using e-mail and LiveChat for alternatives to the Call Center. In addition, passengers may vist our AirAsiaZest office in Incheon Airport for walkins at our Customer Service Desk. We are open daily from 10am – 5pm. Again, our passengers are a priority for us and we hope for your kind understanding during this schedule alignment as we continue to make great efforts in improving our service offerings.